Tragically, eating disorders are increasingly prevalent among Jewish and Orthodox adolescents. They can be life-threatening and lead to short and long-term psychological and medical complications. Prevention programs and early detection are critical in order to avoid severe, chronic disability among those susceptible to these disorders. However, due to the denial of the problem by the adolescent, and occasionally even her (or his) family, these problems can go undetected and untreated for long periods of time. Often the problem will first be identified by school personnel - either in high schools or more frequently when the student is studying in Israel; in many cases the family will turn to educators for guidance. 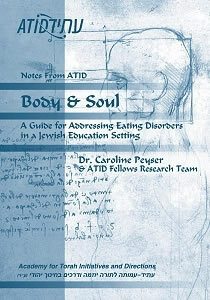 Prepared by Dr. Caroline Peyser and an ATID Fellows Research Team, Body & Soul is an invaluable guide to Jewish educators and schools: spells out the basics of eating disorders and treatments in laymen's terms ("everything you need to know, but…"); reviews current and notable school programs and policies; recommends specific policy changes; recommended resources; and provides a guide to Jewish sources on health, diet and self-care - not as a replacement for treatment, but in recognition that a Jewish school must frame the issue as part of a larger campaign of Torah education. While this topic may admittedly be a departure from some of the issues ATID has addressed in the past, it is part of our effort to raise awareness - and empower through knowledge - regarding the wide array of challenges facing Jewish life, learning, and schooling. 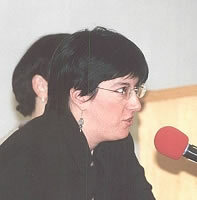 Dr. Caroline Peyser made aliyah ten years ago after completing her doctorate in clinical psychology at Yeshiva University. She has worked in a number of eating disorder clinics including Yale-New Haven Hospital in America and Hadassah Hospital in Israel. She currently works in private practice in Jerusalem with a sub-specialty in eating disorders. In addition, she has been an instructor of Talmud at Midreshet Lindenbaum for many years. Dr. Peyser is a member of ATID's professional advisory board and a faculty mentor. Body & Soul was co-authored by an ATID Fellows Research Team: R. Uri Cohen, R. Yisrael Cohn, Udi Marili, Bracha Rutner, and Beila Sosefsky. Does Halakhah Care About How I Eat?